Republicans and Democrats hardly see eye to eye when it comes to views of the news media. 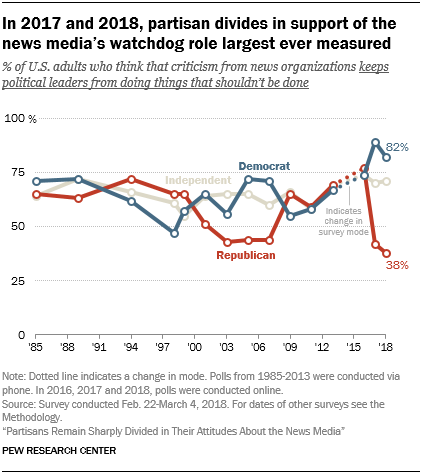 As in 2017, the most striking difference between members of the two parties continues to be their varying support of the news media’s “watchdog role” – the idea that criticism from news organizations keeps political leaders from doing things that they shouldn’t be doing. Overall, most Americans (65%) say news media criticism keeps political leaders in line, while about three-in-ten (31%) say that media criticism keeps leaders from doing their job. But the share of Americans who support the news media’s watchdog role has dropped 10 percentage points between 2016 and 2018 – driven largely by declines among Republicans. Two years ago, before the 2016 election, about three-fourths of both Republicans and Democrats expressed support for the news media’s watchdog role. Last year, however, the parties diverged sharply in their views, and in 2018 Democrats continue to be about twice as likely as Republicans to support this role (82% vs. 38%, respectively). This 44-percentage-point difference is about as large as that seen in 2017, when there was a 47-point gap. Most independents (71%) continue to support the watchdog role of the news media, although how they lean ideologically does influence their views. Independents who lean toward the Democratic Party and those who lean toward the Republican Party are also strongly divided (87% vs. 51%, respectively, say news media criticism keeps political leaders in line). While a majority of Americans support the news media’s watchdog role, most also continue to see a lack of fairness in news coverage. About two-thirds of Americans (68%) say that news organizations tend to favor one side when they cover political and social issues, compared with three-in-ten who say that news organizations deal fairly with all sides. The portion who says they tend to favor one side is slightly lower than in 2016, when 74% said so. As in previous years, Republicans are far more likely than Democrats to say the news media favor one side. In 2018, the vast majority of Republicans (86%) say news organizations favor one side in their coverage, 34 percentage points higher than Democrats (52%). Unlike Republicans – whose views have remained mostly unchanged over the last three years – Democrats are now less likely to say news organizations favor one side, declining from 64% in 2016 to 52% in 2018. Independents’ perception of fairness in news coverage – as with their views of the media’s watchdog role – falls in between that of Republicans and Democrats, with about 72% thinking that the news media tend to favor one side. And just like with support of the watchdog role, partisans are split at historic levels on whether they perceive the news media as favoring one side. 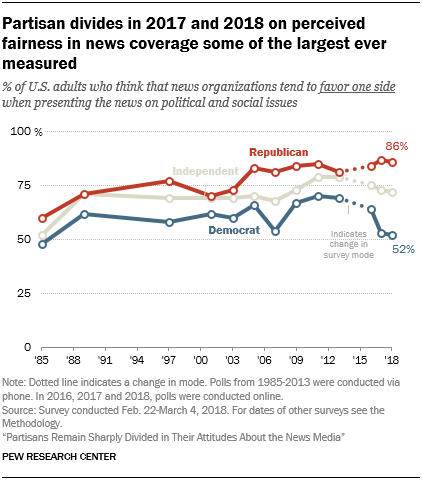 In both 2017 and 2018, the differences between Republicans and Democrats in perceived fairness of news media coverage are larger than at any other point over the past three decades except in 2007, at the end of the George W. Bush presidency when partisans were about as split as they are today. When comparing the different pathways people can get news, more Americans have a lot of trust in the information they get from professional news organizations than from friends and family or social media – although few express high levels of trust in any of these sources. And just as there were differences between Republicans and Democrats in views of the news media’s watchdog role and perceived fairness in news coverage, there are notable partisan differences in how much they trust information from national and local news organizations. About one-in-five Americans (21%) have a lot of trust in the information that they get from national news organizations. Slightly more have a lot of trust in information from local news organizations (28%). Fewer Americans (13%) express this level of trust in the information they get from family and friends, and a mere 4% say they trust the information they see on social media a lot. These numbers are mostly unchanged since 2016. 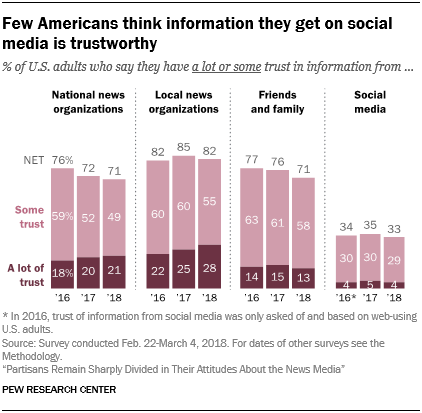 This gap for social media remains when looking at how many Americans have at least some trust (a lot or some trust) in the information they get from these sources. 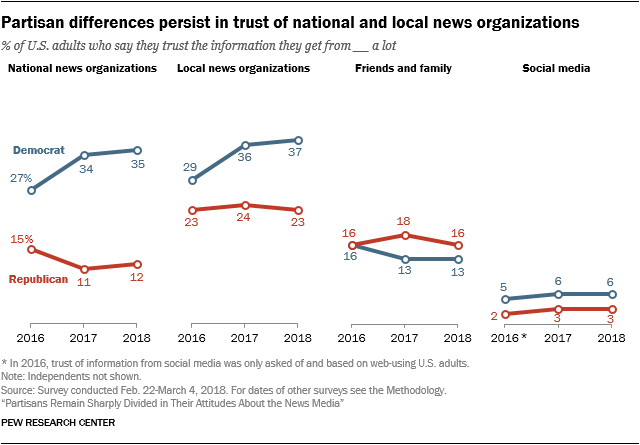 Large majorities have at least some trust in information from national news organizations (71%), local news organizations (82%), and friends and family (71%). The same cannot be said of social media, however: Only a third say they have at least some trust in the information they get from these sites. A partisan gap in trust also exists, with Republicans again expressing far lower levels of trust in information from news organizations, particularly national news organizations. About three times as many Democrats as Republicans have a lot of trust in national news organizations (35% vs. 12%, respectively). A smaller gap emerges when it comes to local news: 37% of Democrats have a lot of trust in local news organizations, 14 percentage points higher than Republicans who say the same (23%). Among independents, about two-in-ten (19%) have a lot of trust in the information they get from national news organizations, and one-quarter do for local news organizations. There is little difference between Republicans and Democrats in the share who say they have high levels of trust in the information they get from their social connections – either from their friends and family or through social media.